Also Recommended: Scrapped Princess, Elemental Gelade, Tower of Druaga. Notes: Based on the light novel by Isao Miura, with illustrations by Luna. There's also a manga version by Kotaro Yamada, serialized in Monthly Comic Alive. Cecily Campbell, a knight guard of the Campbell household, gets involved in a battle in the market district. There, she is almost killed by a crazed soldier looking for "salvation" until a young boy named Luke rescues her by slicing the old soldier's sword in two with his own. Impressed by this, Cecily sets out to get him to craft her a sword of her own, and promptly gets involved in a 44 year old business centered around the Valbanill Wars, when demon contracts were made at the cost of human lives. 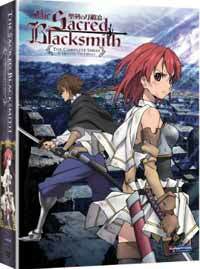 The Sacred Blacksmith is another show I ordered on a whim. However, a few days after I got the shipping confirmation, I learned that The Sacred Blacksmith was credited to the creators of SHUFFLE!, so it was with a rising sense of dread I watched the show. I guess I should be thankful that the main story is based on a novel which isn't connected to that asinine piece of work, but some of the stain can still be seen, heard and felt in The Sacred Blacksmith. Due to this (and other people probably doing more research than me before picking up shows), it's not an unfair assumption to make that people will be watching this because of the female cast. And you should, because they take up most of the screentime in the show, mostly due to making up most of the main cast roster. Despite this, The Sacred Blacksmith plays a rather serious song, and one with quite a few verses. A lot of them are based on fairly typical fantasy elements, which unfortunately makes the show somewhat predictable. (I dare anyone to play the "guess who the man in black really is" game and actually get it wrong. Trust me; it's nearly impossible.) The rest tends to stick to semi-serious drama, centered around various temporary guests, like Charlotte. The first time we meet her, she's trying to... "obtain".. the demon sword Aria, which was placed in Cecily's care. With her is her three servants -- all female, of course, and young ones at that. But even if they got off on a seriously bad start, Charlotte's biggest desire is actually about as heartfelt as this show gets, and I don't mean that in a bad way. Cliched way, yes, but not necessarily bad. The main character in The Sacred Blacksmith is unquestionably Cecily. She's what you'd describe as "spunky", and her character is the real telling point that the creators of Shuffle is behind this show; unlike the novel -- or the manga, for that matter -- the anime portrays her as really clumsy at first. Her introductory scene is also what makes her come across as a bit of a hypocrite at first as well; wherein she defends a merchant's right to set his own price for his wares, but balks at having to pay Luke for making her a sword later on. Through her, the show also unfortunately falls into the habit of really preachy speeches, as Cecily must love to hear herself talk. This turns into overdrive once she gets partnered up with Aria, the demon sword of wind. Thankfully, Luke balances the show out with his pragmatic outlook on just about everything. Being about Cecily's age, he naturally immediately becomes her romantic foil, much to his displeasure. Unlike Cecily's near-endless optimism and can-do attitude, Luke is rude and cold on the surface. Their relationship quickly takes on a Ranma-Akane dynamic, which is not the best of news if you don't care for people nagging and bickering every time they meet. Thankfully, Luke is rarely far away from his partner and workmate, the pointy-eared little girl named Lisa. She serves as the show's peacemaker for the most part, trying to quell any arguments between the two. Unfortunately, in another move that kind of betrays the anime creators being the cast behind Shuffle; she's also extremely servile and low-maintenance, which eventually ticks off Cecily and makes her take the two out for a little shopping spree. Like another show I recently watched, the comedy sessions in The Sacred Blacksmith is a bit hit and miss. Sad as it is to admit, the "best" of the comedy is centered around Cecily's chest. Apparently, Sacred Blacksmith thinks it's just a hoot to remind us every now and then that she's actually quite voluptuous, as if her hilariously impractical armor design wasn't already making that blatantly clear. (Curiously enough, all the men in her knight unit are also wearing the same kind of midriff-baring armor plates, though thankfully, much like Cecily, they are also wearing belly-covering textiles. I'm sure that must be a great relief if or when any of them take a sword blade through the stomach.) My favorite part, however, is the part in the middle of the show, where Charlotte and her guardians arrive at Cecily's manor not long after they tried to take her sword, and were certainly not above killing her. There, they meet up with Fio Atkins, the caretaker of House Cambell. By that time, she had already heard about the murder attempt, and took it rather.... well. The resulting lesson in humility for the deserving is just great to watch. The Sacred Blacksmith even got a dub, and a pretty good one at that. I can only hope that the original Japanese script is better than what you hear in English, though, because most of the lines in this show are just horrendous. I've already mentioned the show's penchant for speeches and lecturing, but even the light dialogue can be pretty painful at times, mostly due to the show's tendency to repeat itself as if its audience are all idiots. Buuuut even my cranky, old guy self has to admit that, when it comes down to it, The Sacred Blacksmith is pretty decent. While the comedy isn't all that, it also never really goes too overboard in trying to be funny, and the serious parts can actually get pretty grim when it comes down to it. Unfortunately, the show is also incomplete, which is going to be a dealbreaker for any potential viewers. Its ending is self-contained enough, but many of the plot points introduced in this series are not resolved, and unless this show gets sequels, never will be. That's something you have to take a stand on even before considering watching this. The show also tends to get violent every now and then, and it's actually treated rather seriously for the most part. People die, gruesomely when demons are involved.